Terrell Michael Ahmaury Harris obituary. Carnes Funeral Home. On wonderful warm day, April 24, 1998 God sent a special blessing in the form of a baby boy to Michelle Williams and Toie Harris. Terrell Michael Ahmaury Harris brought so much joy into the life of his family. Terrell was a member of Greater Saint Matthews Baptist Church in Hitchcock. He accepted Jesus as his Lord and Savior and was baptized by his great-uncle and Pastor Reverend William L. Randall, Jr.
Terrell was an adventurous boy who enjoyed playing outside and just being a boy. He loved hunting, fishing and riding his ATV. His warm caring personality and his bright smile touched the hearts of so many people. He loved his family and enjoyed spending quality time with them. 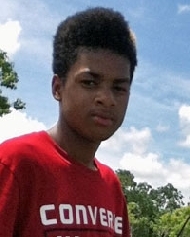 Terrell loved FOOD, and all sports especially football, and basketball. He played football for the Hitchcock Red Raiders; a member of the Crosby school band, where he shared his love for music by playing the bass drums. Terrell just completed his eighth grade year at McAdams Junior High School and was looking forward to attending Dickinson High School and becoming and "OFFICIAL Gator". On June 10, 2013 God sent his angels to bring Terrell home to live with him in Heaven. He was preceded in death by his grandparents, Gloria Williams, Kenneth Singleton and Reverend Donald Harris and great grandmother, Shirley Singleton and other loved ones. His loving memory will always be treasured by his beloved family, his mother, Michelle L. Williams; father, Toie A, (Jacquelyn) Harris; his step-father, Lamar Williams; his sister, Lachelle Harris; brothers, Lamar Williams, Jr. and Joshua Williams; other siblings, Salerial Williams and Raphfel Moss Jr.; his grandmother, Elsie Harris; step-grandparents, Marvin (Lorraine) Williams, Sr.; his aunts and uncles, Tashia Harris, Dorothy Williams, Lavillia Spry, Dawan Harris, Deroderick Jonkins, Anthony Williams, Marvin Williams, Jr. and Marcus Williams; his great-grandmother, Mary Harris; his cousins, great-aunts, uncles, and a multitude of friends. The family will receive friends Sunday June 16, 2013 beginning at 4:00 PM followed by a Memorial Service at 7:00 PM. Both services will be held at Carnes Funeral Home 3100 Gulf Freeway Texas City, TX. The Life Celebration will be held at Greater St Matthew Baptist Church 6333 Hwy 6 Hitchcock, TX at 11:00 AM Monday, June 17, 2013. Reverend William L. Randall, Jr. will conduct the services. There will be a burial immediately following at Forest Park East. Webster, TX. Memorials may be sent to the funeral home in care of Dorthea Jones, Funeral Director.